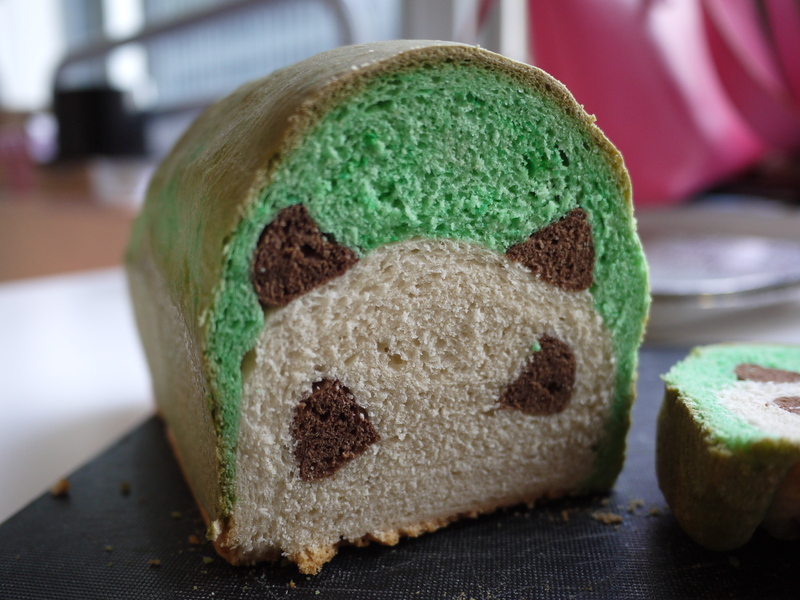 Ever hear of something as awesome as panda bread? No? Google it. Or read on. I’ve never baked any sort of bread in my life, so for this particular experiment, I decided to team up with Maria, who regularly bakes all sorts of bread for our office. Yes, from scratch. The best cooks/bakers tend to be those that make up things as they go, so it can sometimes be hard to get firm recipes from them. Maria falls in this best cooks category. I tried my best to get right measurements, but as she told me “everything in bread making is approximate!” Great. So, here we go! [we somewhat followed this recipe here from the Taste for Adventure blog. their measurements are probably more exact than ours]. Pour the flour into a large mixing bowl and dig a medium-sized well in the middle. Pour the warm milk in the middle and sprinkle the yeast on top of the milk. Wait roughly 10 minutes for the yeast to proof, aka prove it’s alive! Afterwards, begin mixing it with a wooden spoon, add the honey and salt to the mixture. Then begin kneading the dough. Instructions on how to knead here. Divide up the dough into three pieces – 2 the same size as each other, the third is 1/3 the size of the other two….so 1/7th? 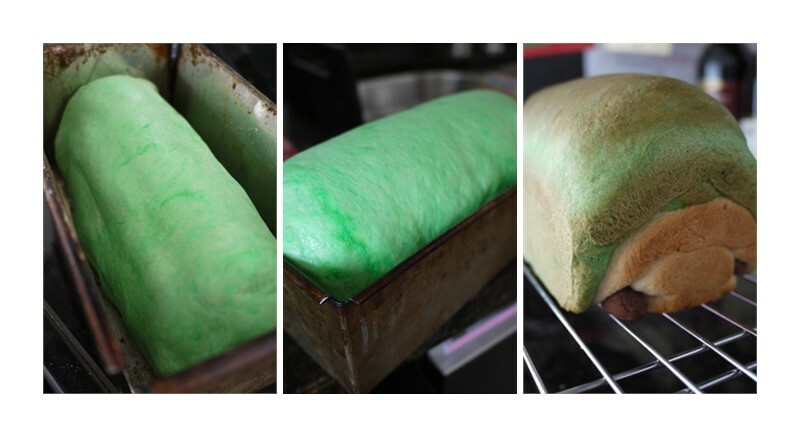 Add green food coloring as you knead the dough to one of the larger pieces. Add cocoa powder to the smaller piece. Place the three dough balls into a lightly greased/oiled bowl and cover the dough balls with saran wrap. Place the bowl in a warm place to let the dough rise — on top of a fridge is perfect. The first rise should take roughly one hour. The dough should be double in size. Next, you assemble the panda. 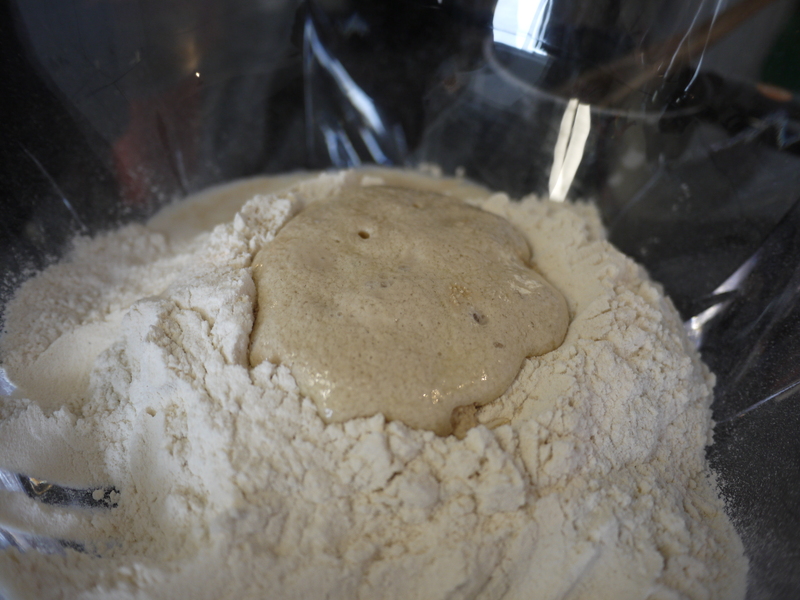 Divide the plain white dough into thirds, with one piece being half the size of the other two. Use one of the larger pieces to form the face. Divide the cocoa dough into quarters (two for eyes, two for ears). 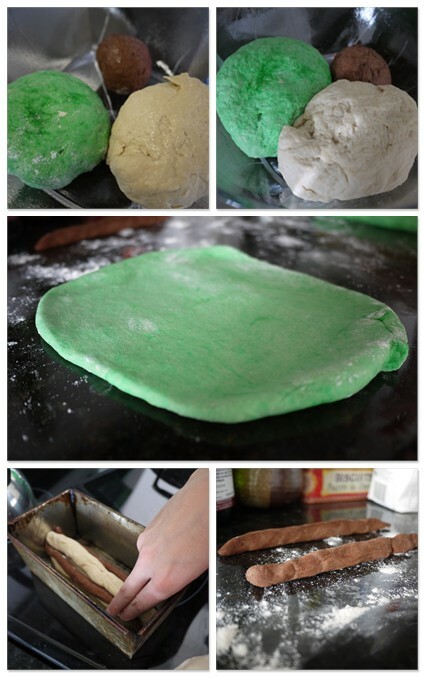 Divide the green dough into two pieces, one twice the size of the other. We found it easier to assemble right into the bread pan, so it was harder to get a picture. The Taste for Adventures post has a great picture. After the panda is assembled into the bread pan, place back onto the fridge (cover with saran wrap) and the second rise should take roughly 45 minutes. Again, the dough should double in size. Then place the bread into the oven for 45-50 minutes at 375 degrees or until the top is golden. You’ll smell it. You’ll also know the bread is done when you tap it and it sounds hollow. Let the bread cool. Finally, the best part! Using a bread knife, carefully make a clean slice. Squealing, shrieking, clapping, and jumping (altogether) when you see the panda is a definite must. Eeeeeeeeeee!! 😀 😀 😀 SO CUTE SO CUTE SO CUTE! Awwwwww so cute!! I think I’ll try to recreate this in a cookie! Oh my gosh! This is way too cute! !